Eva van de Rakt has been head of the Heinrich Böll Foundation’s Prague office since 2004. 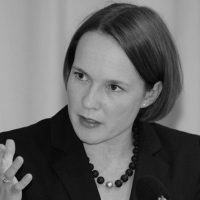 Since 2001, she has worked for the Heinrich Böll Foundation focusing on democracy and human rights, as well as energy and climate policy. The Prague office coordinates the Foundation’s activities in the Czech Republic, Hungary, and Slovakia.